It is just an hour drive from Adelaide, but it seems the further south one travels, the more secluded and versatile the beaches become. 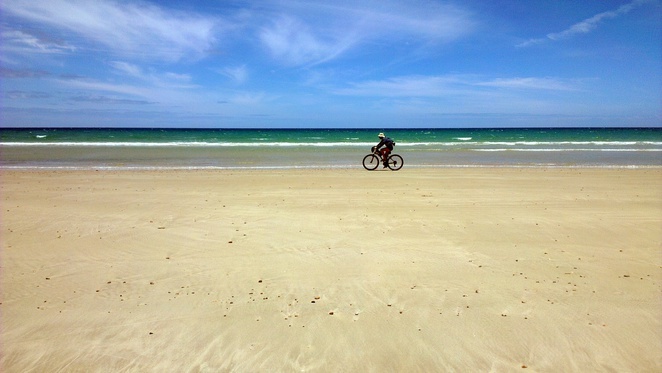 On this summer's day, for example, Sellicks Beach is as beautiful as always and relatively deserted – with the notable and interesting exception of a cyclist, a land surfer, and a couple of ex-gymnasts reliving their glory days. Sellicks Beach, named after the original landholder, was settled in the 1840s when the land was used for grazing and wheat farming. With its pristine coastline and proximity to the McLaren Vale wine region, it has become popular with day-trippers and holidaymakers, but it is also a rural and developing residential area. The beach can be found at the end of Sellicks Beach Road, where the steep cliffs of the Mount Lofty Ranges succumb to the sandy expanse below. There is a general store and the area is well equipped with facilities such as car parks, public toilets, sheltered picnic tables, barbecues, rubbish bins, and a boat ramp. There is no need to tiptoe for kilometres over hot sand to find a good spot to set up for the day; drive there instead. 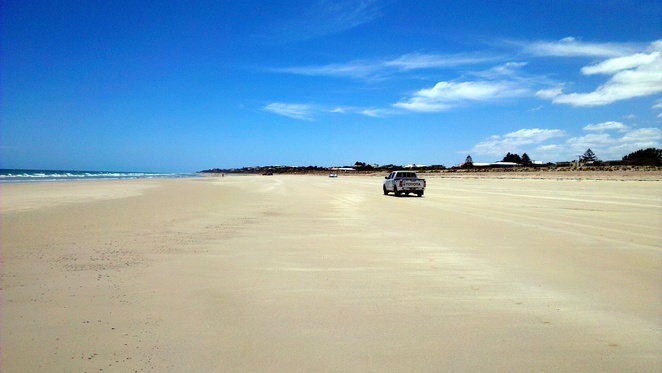 Sellicks, as it is known, is one of only a few beaches in Adelaide where cars are permitted on the sand. 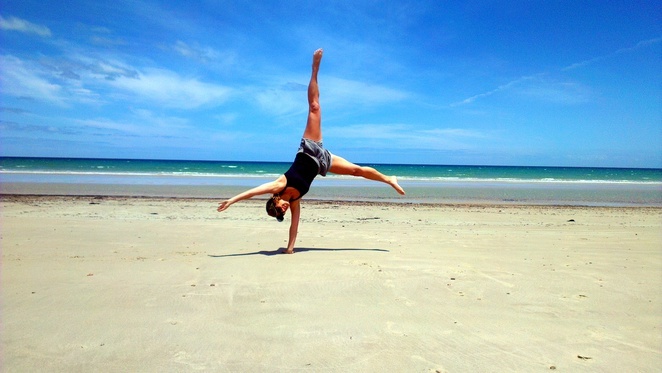 A small fee is required during peak times, but it is free for local residents with a beach pass. 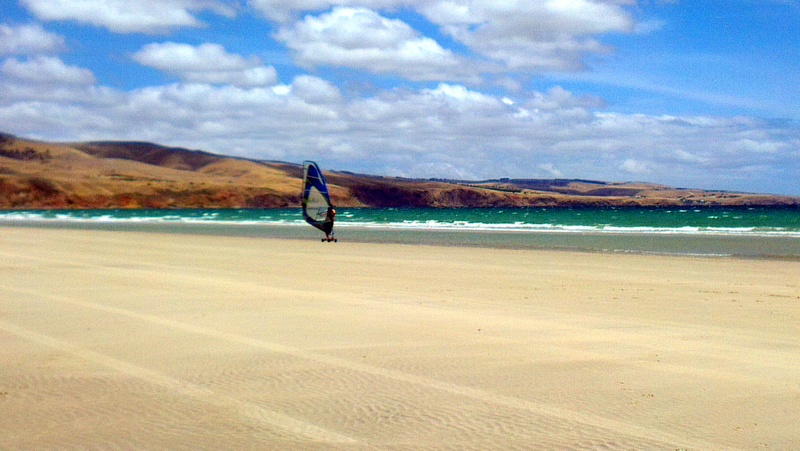 Other drive on beaches in the area include the neighbouring Silver Sands, Moana, and Aldinga Beach. There is a one kilometre sealed walking track along the top of the sand dunes that forms part of the Coast Park Trail. It has a bridge over the storm water retention ponds, which makes a prime viewing platform to watch the local bird life. The linear trail is a nice and easy stroll with beach access at both ends and offers views of the ocean and a glimpse at some of the hottest real estate this side of town. For the very best sea view, however, take a quick walk further south along the Esplanade. The cliff begins to peak and there is an undercover lookout area painted with realistic looking seagulls. A bench makes it the perfect place to sit in contemplation for a moment or more and take in the vast and impressive scenery. It has already been mentioned, but another appealing aspect of Sellicks Beach is that it is usually fairly quiet, at least compared to the beaches closer to the city. Even on the busiest days when a traffic jam appears on the shore and a pedestrian crossing in the sand would not go astray, the beach is long and wide enough to offer a reasonable amount of sand between towels and space to throw the Frisbee around. 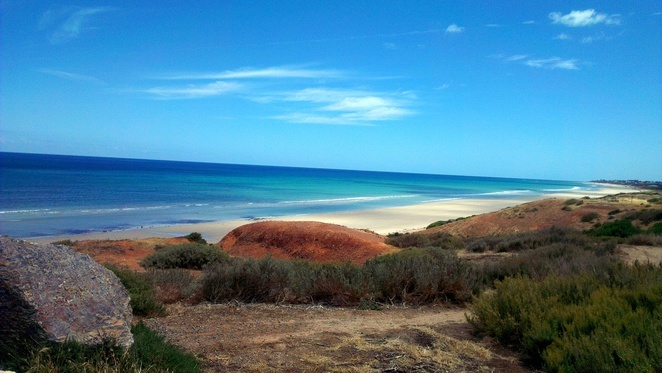 Like most of South Australia's mid-coast beaches, both the sand and water are sparkling clear and clean, so it is a great place for swimming, fishing, snorkelling, and sometimes even surfing. However, unlike nearby Maslin Beach, Australia's first official and most famous unclad beach, bathers are most definitely required at Sellicks. Other than its beautiful beach and the historic Victory Hotel on Main South Road at Sellicks Hill (just before the turn off to the beach), there is very little else at Sellicks Beach. 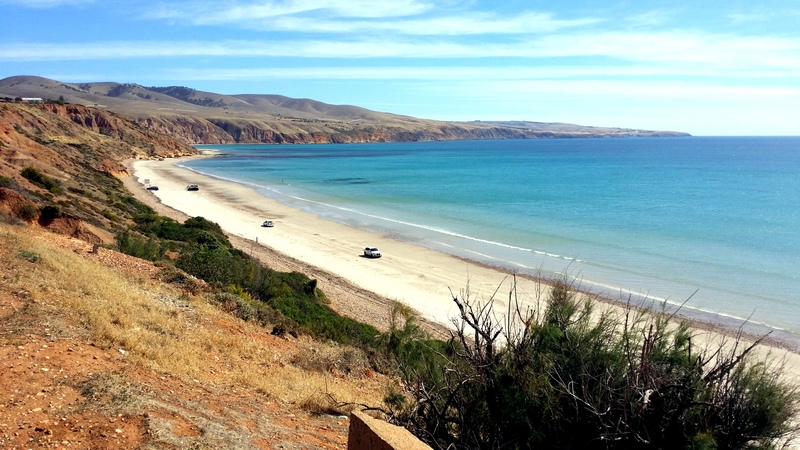 For that reason, it is a good idea to be prepared with drinks and snacks or take a slight detour to the more established Aldinga. It is only about 10 minutes away and there are some nice places for a bite to eat, like Home Grain Bakery, that make not only the stopover, but the trip worthwhile. There is now also a market there, it has been active since June 8th 2014, it used to be every second Sunday but starting in March on the 15th it will continue every third Sunday of the month from 11am to 3pm; at the Community Hall on Riviera Road, William Eatts Reserve. The community hall also hosts other fun activities during the week for the locals. The market provides food and drinks as well and it is called the Sellicks Beach frente al mar Market.